Added levers at the top of each block that can be used to hold open the dropper mechanism if you are experiencing lag. Bigre contributed a special drop to make a total of 50! There are 2-3 drops that included portal blocks as decoration or fall-through special effects. As of Minecraft 1.4, if you are in creative mode and you touch a portal block, you will be instantly teleported to the Nether (no chance to avoid). If you accidentally enter the nether before signs tell you to go through a portal, use the /kill command to get back to your last save point. There were a total of 45 valid entries that received scoring in this challenge. The total score for each entry was a maximum of 15 points. Seven drops were tied for third place at 10 points. Again, THANK YOU to everyone who entered. Regardles of numeric scoring, every drop was AMAZING and tells a story about the author! Contest is now live. Thanks for your support!! lol i just sat and watched your sigs in sync...its kind of funny. but in all seriousness, are we allowed to make a map that has multiple jumps? like the kitchen in "The Dropper"
Yes, as long as all the other rules are followed - be creative! Heyo! Sorry 'bout asking in the comments on youtube, so I'll ask here. What should we do about the floor? If we aren't allowed to move the exit, putting a floor above the bedrock would block it, but we aren't allowed to replace the bedrock with anything. Also, if I put, say, villagers in my map, would they still be there when you copy & paste the map into the final product? I can copy villagers, yes. You may want to block the exit so they don't walk away. As to the exit and the floor. I will ammend the rules. I may rethink this, but for now, leave the exit there and feel free to cover/block it with the floor. I will move it up a few blocks in the template and manually fix when I compile the map. Should we assume mobs are on? I had this idea of using zombies + snow golems! Exit moved up one block to allow a floor to be placed at the bottom of the shaft. Game mode turned to creative. One more question, sorry for being a pest. Should we assume they're playing our map in the day, or should we design the drop to work in either day or night? It will depend entirely on the players and how fast they progress. You could put a sign near the dropping mechanism with your recommendation. You can still do one, I bet two back-to-back space adventures would be awesome. I added an FAQ section to the main post for rules clarifications. What's your progress? I'm only 1/5 done I think, so not that far yet. I'm really curious to see all the different drops. I'm almost done. I'm just working with redstone timings for optional special effects (by optional I mean they can be toggled at the start of the drop). I also have a scoring system! But timing everything right on this thing is HARD! What do you reccomend I use to build this? I can't go back to 1.2.0 or whatever for MCEdit because this is in Anvil. I doubt you did all the walls by hand, that'd sound dreadful, almost like torture. Here's a download link to my entry if anyone needs inspiration, etc. I'm going to improve it a bit so you actually get a reward if you snag all 3 "dare points". I may fiddle with timings for a little longer as well. You know what would be cool? A note block song that travels down with you. That would be VERY HARD to time, though. Also a suggestion to anybody using optional redstone effects: make sure it can be turned off (some players have laggy computers and redston effects would make the map unplayable if they can't turn them off). 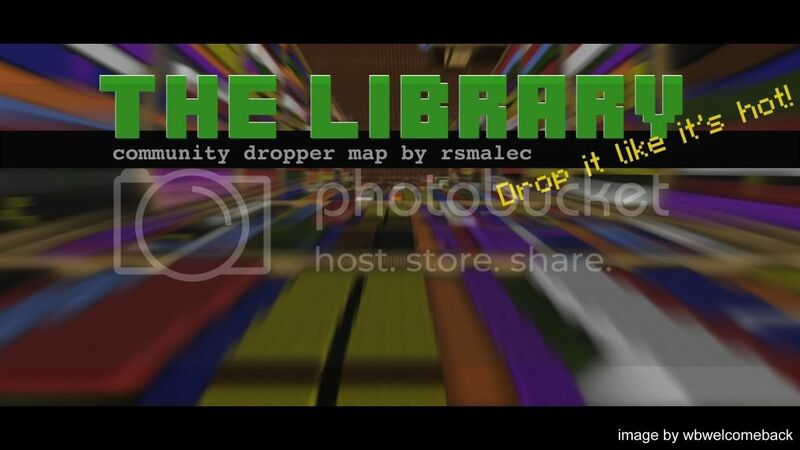 I just updated the drop to have a bit more eyecandy and I fiddled with timings and positions of things. Plus, there is now a reward for getting all 3 dare points! Two questions: You say we're not allowed to change to drop mechanism but we are allowed to feed redstone off of it. Does this mean we can remove bedrock blocks from the outside in order to feed a line out as long as it's not visible from the inside and doesn't affect the mechanism? Also, I know we're not being judged on sign text colour, but hypothetically, what's the code when writing the sign as I can't seem to get it to work. There is an MCEdit compatible with Anvil (someone linked it above), but I only use that tool for copying large areas of land. You were the first entrant, congrats. General note to everyone - I won't be opening/looking at any of the emails for at least a week, so only send me your FINAL entry and make sure to include your name and the name of your entry (per the rules). You say we're not allowed to change to drop mechanism but we are allowed to feed redstone off of it. Does this mean we can remove bedrock blocks from the outside in order to feed a line out as long as it's not visible from the inside and doesn't affect the mechanism? Yes. But it should look the same from the 'inside' for all maps. I know we're not being judged on sign text colour, but hypothetically, what's the code when writing the sign as I can't seem to get it to work. /sign edit "&4Line1" "&fLine2" "&2Line3" "&54th Line"
The number/letter after the ampersand (&) is the color code. Be aware that you need to count the number of letters in each line. The color code is invisible characters that take up space in each row. When you use the command, the sign may LOOK correct, but if you log out and back in it will truncate any letters that were over the limit. Gotcha, thanks, I think mine's essentially all done, but I won't submit it just yet as I keep coming up with new ideas and tweaking difficulty.